Hey everyone! 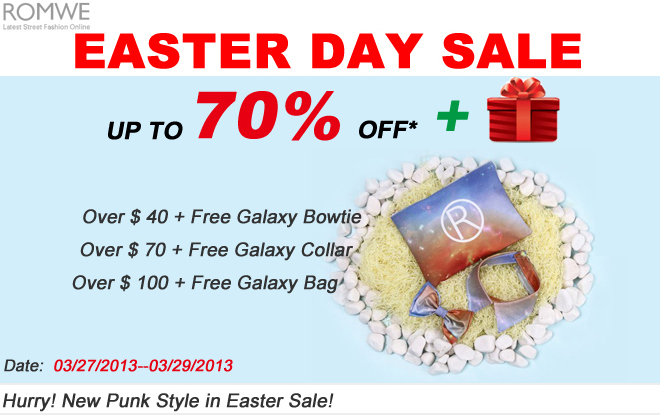 Today I'm spreading the news of the Romwe Easter Day Deal: Get Free Galaxy Bowtie When Order Over $40; Get Free Galaxy Collar When Order Over $70; Get Free Galaxy Bag when Order Over $100. Olá o todos! Hoje vim partilhar a notícia da novidade de Páscoa da Romwe- Romwe Easter Day Deal que vos dá a oportunidade de receber vários items da linha galaxy!